DEFINITION: The grove at Athens where Aristotle taught; a hall where public lectures or discussions are held; an organization presenting public lectures, concerts, etc. Winning the 1992 National Spelling Bee was a blip  albeit a major blip  on the impressive continuum that is Goad's life. "That was a big event for me, an exciting thing, and I'm glad it happened," she says from her office in New York City's Environmental Law Division. But there have been other highlights, too, including winning $31,200 in the 1996 Jeopardy! Teen Tournament, earning a perfect SAT score and graduating in 2005 from Harvard Law School. As a young girl with "not very stylish glasses and the bangs and all that," she attended a Richmond, Virginia, school where spelling was a big deal: competitions in classrooms and school-wide. Going to the nationals was a natural progression, and Amanda's only coach was her mother. The trip itself wasn't memorable because the Goads lived a scant two hours from Washington and had seen all the sights. 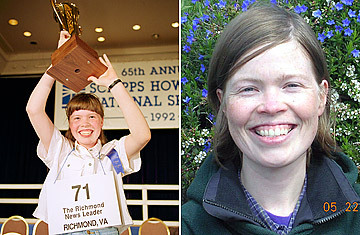 Photographs remind her that she was wearing a polo shirt and blue jeans when she won. She listed her championship on her college applications. She got into Rice University, which was her first choice. Upon graduation she spent two years in Teach For America in a barrio of new immigrants east of Palo Alto, California. Today her trophy rests  with other trophies  in her parents' attic. Now 28, she doesn't mention her championship on resumes and generally waits until she knows a new acquaintance pretty well before sharing her past. She runs in charity races with themes having to do with global warming awareness. She's also joined petition drives to Stop the War in Iraq and has also campaigned for gay causes. She still enjoys trivia games, "but only for fun."